The premise was original and exciting: every year two children are chosen from each part of the country to compete in the annual Hunger Games, a televised fight to the death with only one victor. The games are a way for the government, called “The Capitol,” to keep the country’s residents in line, 75 years after they rebelled. With the scene already set and the characters introduced, director Francis Lawrence (no relations to the actress) is free to amp up all the elements involved to create a spectacular motion picture, catching fire like the character of Katniss. Unexpectedly, he also chooses to highlight the political subtext of the story: the haves versus the have-nots, abuse of authority, our culture’s obsession with celebrity, and the distractions of fashion and the media. Even viewers who haven’t seen the first movie can pick up and enjoy the story in this second movie, in part because of the storytelling skill of the director and screenplay writers. The film is shot in a wonderfully visual narrative language with beautiful cinematography which serves to cut extraneous and clunky exposition and heighten the viewer’s involvement. 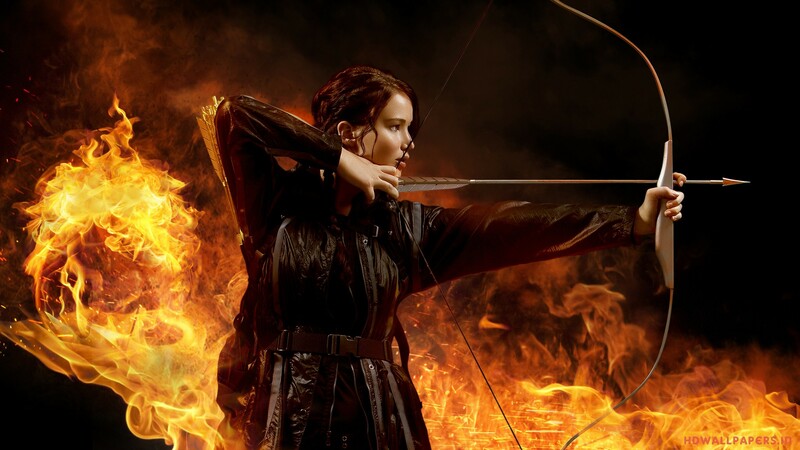 The characters and story are also taken to a new level, as the victors from previous years’ games are forced to participate in yet another televised competition to the death, a “quarter quell.” Having believed their lives were now safe and secure, the previous winners – including Katniss and ally Peeta – are furious and resentful at having to fight for their lives once again. Katniss is intensely troubled by her memories of killing other contestants, and neither she nor Peeta are willing to stick to the scripts dictated to them by the Machiavellian President Snow’s (Donald Sutherland) government when on their “Victory Tour.” Instead their basic humanity unwittingly serves to stir the citizens to rebellion. The stakes are higher than in the first movie. Not only do Peeta and Katniss have to battle deadly previous victors, but if they don’t behave as expected, President Snow promises that their families will suffer. The frivolous and decadent ruling class in the Capitol is vibrantly brought to life in a way that outshines their depiction in the previous movie, and does justice to the novels. Everything is more colorful and outrageous, from the outfits of callow contestant-handler Effie Trinkett (Elizabeth Banks) to the spectacles designed to show off the contestants to the crowds. The scene in which the combatants are reintroduced to the Capitol is especially outstanding, as they ride in Romanesque horse-drawn chariots around a huge circular arena to a cheering audience. Many small touches add to the Roman theme of the event, such as the make up Katniss wears, which recalls Elizabeth Taylor as Cleopatra. At this point, more of the story’s underlying themes start to rise to the surface, as comparisons to the Roman Circuses are inevitable. Roman death matches have come back in style. Panam starts to resonate more like Pan America, as the societal structure of the “haves” in the Capitol living off of the “have nots” in the districts. The drawn out US economic downturn the US gives this analogy a certain energy. The characters themselves make the connection more explicitly, as mentor Haymitch (Woody Harrelson) reminds Katniss that her real enemies are not her fellow contestants, but the government who creates the games. The games themselves are heightened as well. The game arena is enormous and complex, with even the weather completely controlled by the game master, Plutarch Heavensbee (Phillip Seymour Hoffman). Many of the arena scenes were shot in Hawaii, and the natural splendor of the location sets off the poverty of the poor districts well, and makes the jungle aspects of the games more realistic. Both the special effects and fight scenes are vivid and exciting, and serve the interest of the story, involving the viewer more deeply. The script for “Catching Fire” seems tighter and more focused than the one for “The Hunger Games,” despite the 2 hour and 27 minute running time. We can thank Oscar-winning screenwriters Simon Beaufoy (“Slumdog Millionaire”) and Michael Arndt (“Little Miss Sunshine”) – credited as Michael deBruyn – for less exposition and more suspense and character development. Katherine Lawrence is now a more assured actress, and her portrayal of Katniss is more in line with the novels than in the first movie. She is emotionally wrenching when the scene calls for it, and displays an admirable lack of vanity when her character is in distress. Other Academy Award winning actors, which fill out the cast in smaller roles, adds to the quality of the film. The movie was partially shot in IMAX, and the format is used in service to the story, rather than as a distraction or a gimmick. The success of the first movie has given the makers of the second movie the luxury of higher goals, a higher budget, and more lee-way to focus on character development and interaction. Director Lawrence makes great use of them and the audience becomes more emotionally involved. Usually audiences are left dissatisfied when the second movie of a trilogy ends abruptly, but Catching Fire’s ending left the viewers energized and wanting more. As much as I enjoyed discovering and exploring the world of The Hunger Games in the first novel, I think I enjoyed this 2nd book in the trilogy more. I was more invested in the characters, and I liked seeing a shift in Katniss, the main character, as she becomes more compassionate and more aware of others as more than possible sources of competition. It’s almost 400 pages long, but I found it a fast and fun read.